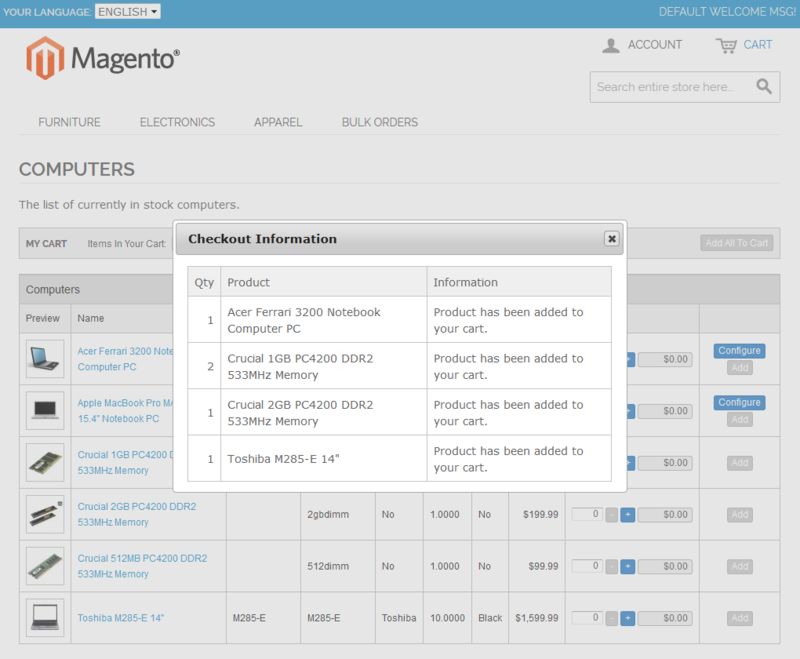 Bulk Orders Center For Magento is an extension allowing you to define pages along with the products displayed on them. On those pages your customers will be able to quickly and easily make orders containing multiple products as well as modify them on the fly. 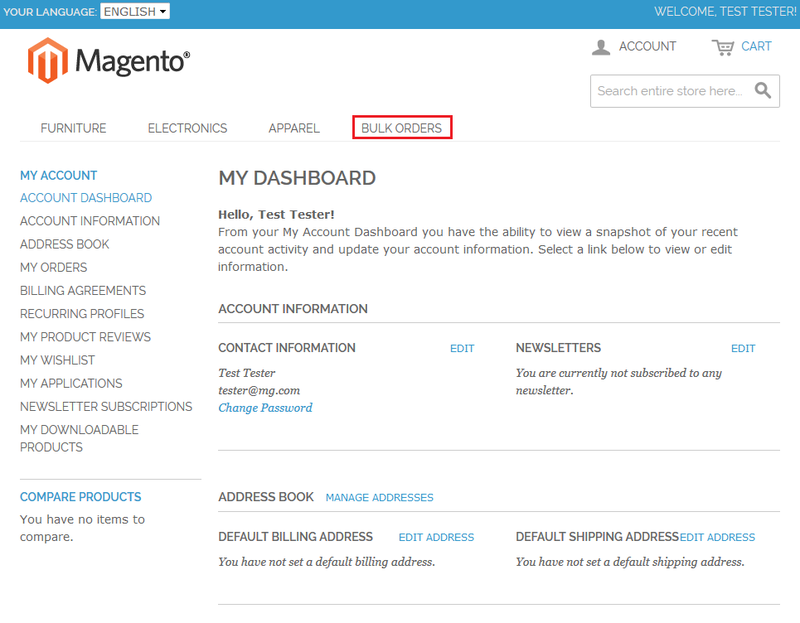 This tutorial will show you how to successfully install Bulk Orders Center For Magento. 1. 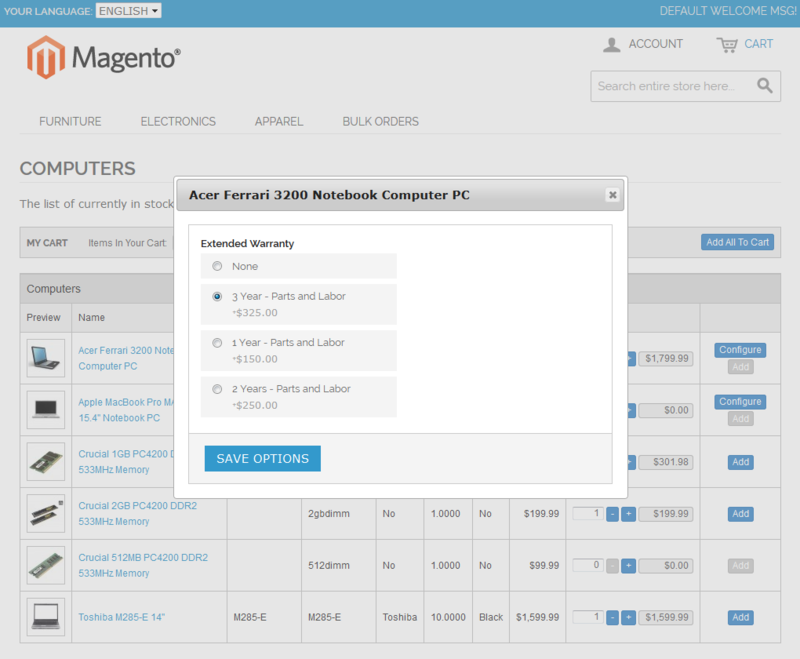 Log in to our client area and download Bulk Orders Center For Magento. 2. 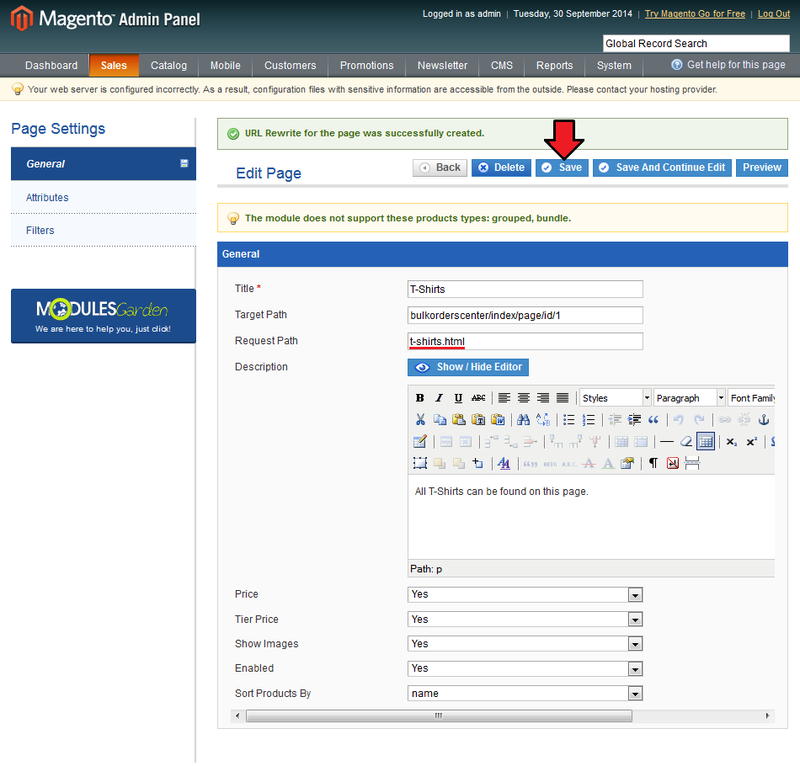 Upload and extract the extension into the main Magento directory. Files in your Magento directory should look like this. 3. 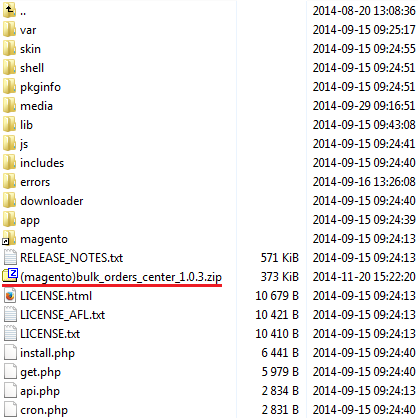 When you install Bulk Orders Center For Magento for the first time you have to rename 'license_RENAME.php' file. File is located in '/app/code/community/Modulesgarden/BulkOrdersCenter/license_RENAME.php'. Rename it from 'license_RENAME.php' to 'license.php' . 4. In order to configure your license key, you have to edit a previously renamed 'license.php' file. 5. 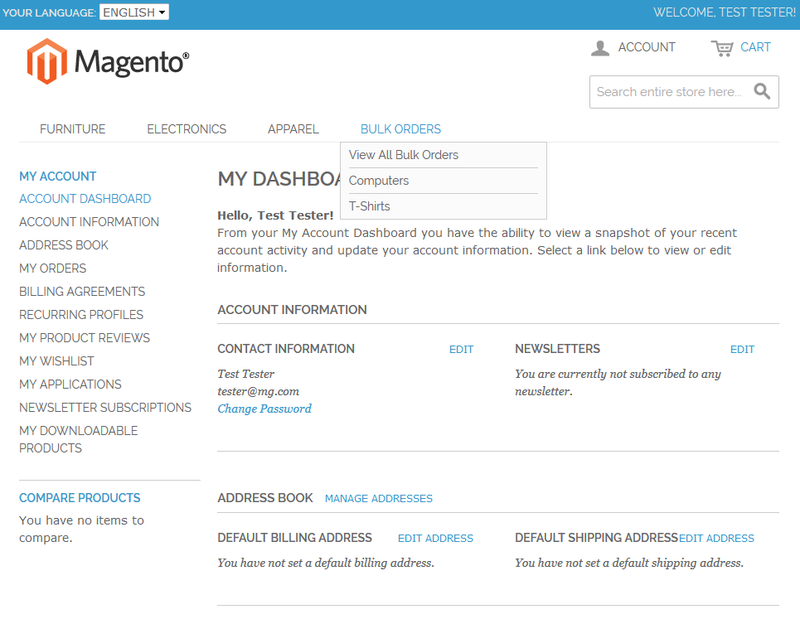 Now, log in to Magento and go to 'System' → 'Cache Management' . 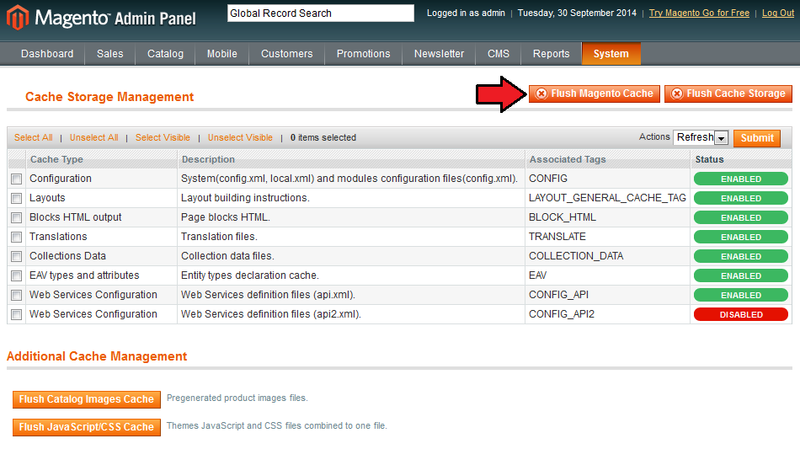 Press 'Flush Magento Cache' , otherwise Bulk Orders Center won't even appear in your system. 6. 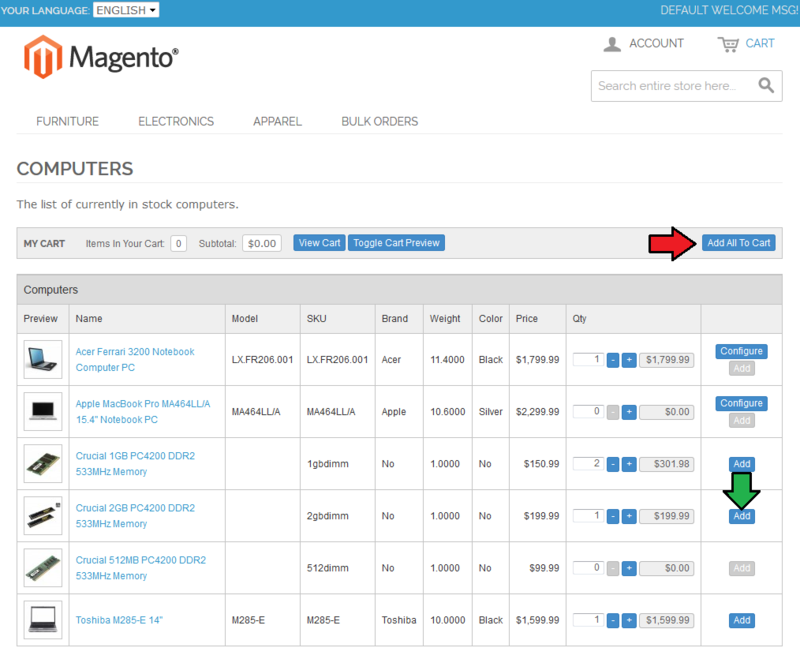 Re-log into Magento admin panel and proceed to 'Sales' → 'Bulk Orders Center' → 'Configuration' . 7. Click on 'General' section. Here you can enable and define Bulk Orders Center name in the customer account dashboard, enable/disable the images of products and enable/disable custom jQuery libraries. Press 'Save Changes' to proceed. Note: We recommend enabling jQuery libraries if you are using custom jQuery. 8. 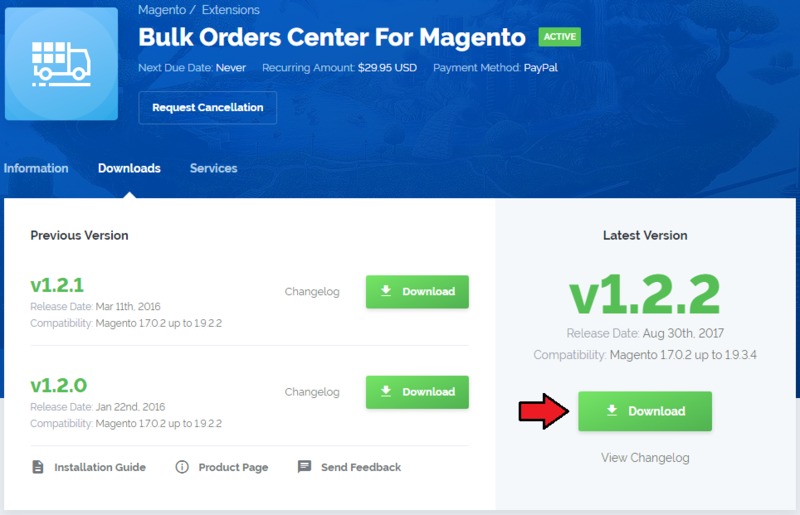 You have just successfully installed Bulk Orders Center For Magento! 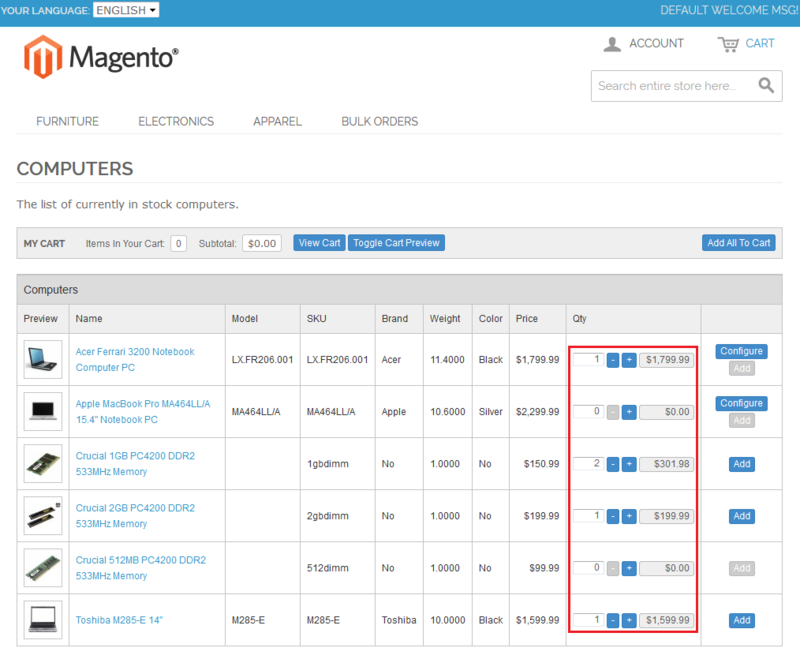 Bulk Orders Center For Magento allows your customers to order multiple products, quickly and easily, from a single page in your Magento front-end. Let's proceed to 'Sales' → 'Bulk Orders Center' → 'Pages' where you can configure each of the pages separately. In the beginning there is not even a single page configured as you can see on the following screen. 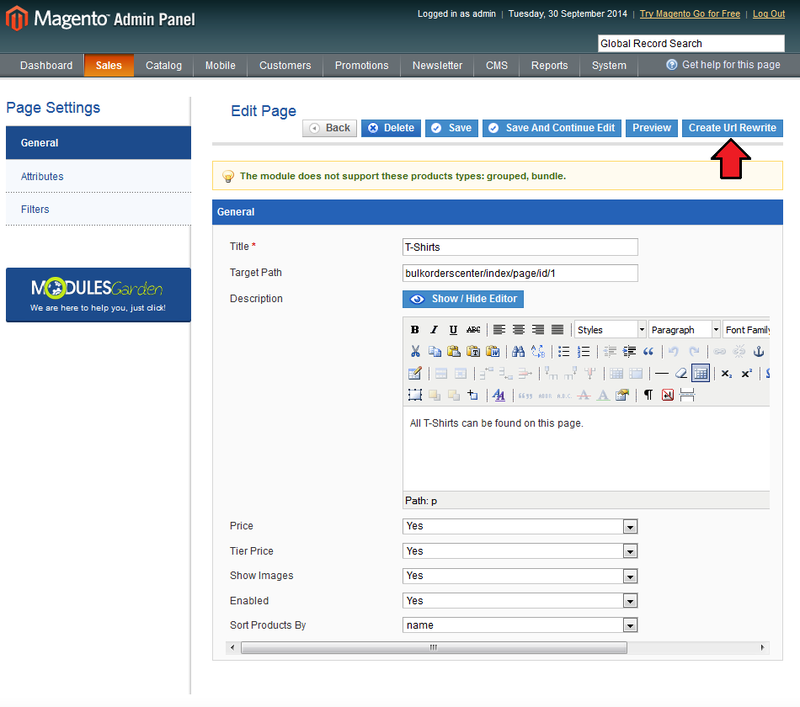 In order to create a new page press 'Add Page' button. Fill in a page name and its description. Additionally, you can define whether to display price, tier price and image or not. 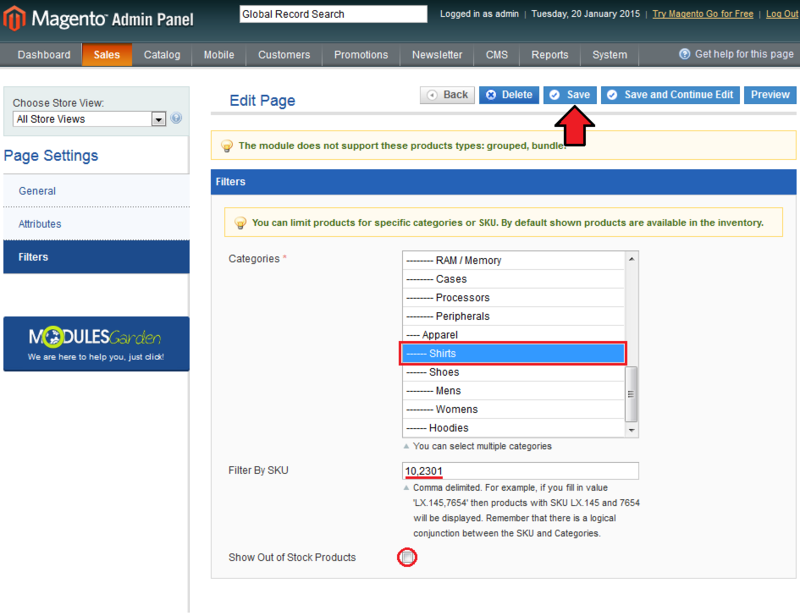 You can also disable selected page and define how to sort products on the page. 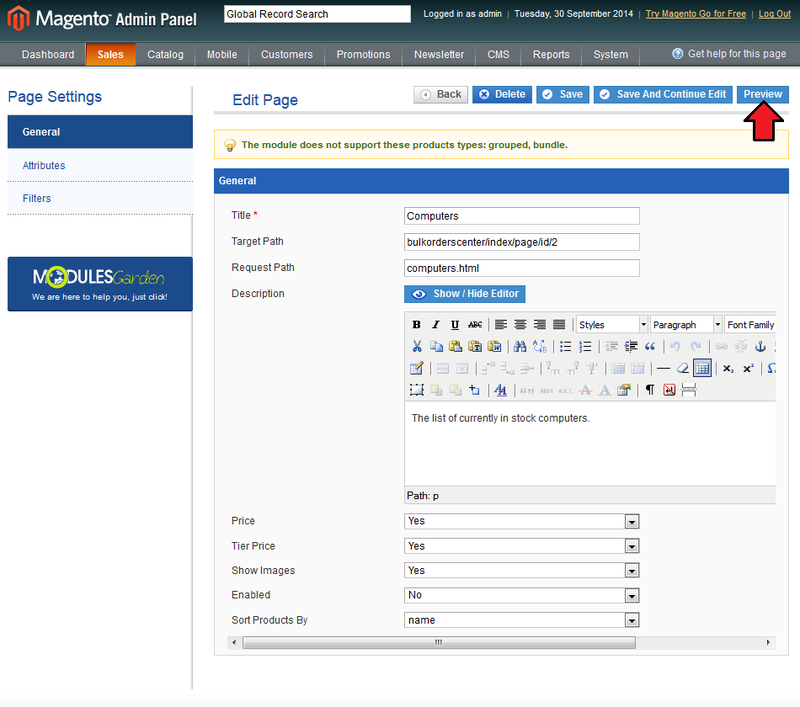 Press 'Attributes' to continue configuration of the page. Note: By clicking on 'Show/Hide Editor' button you can switch between editor and raw HTML code. Now, select attribute set and select which attributes should be visible on the page by marking checkboxes next to them. Enabled attributes are shown in 'Enabled' column. You can change the order in which they are displayed through the usage of up and down arrows marked on the following screen. Press 'Filters' to proceed to the last step. 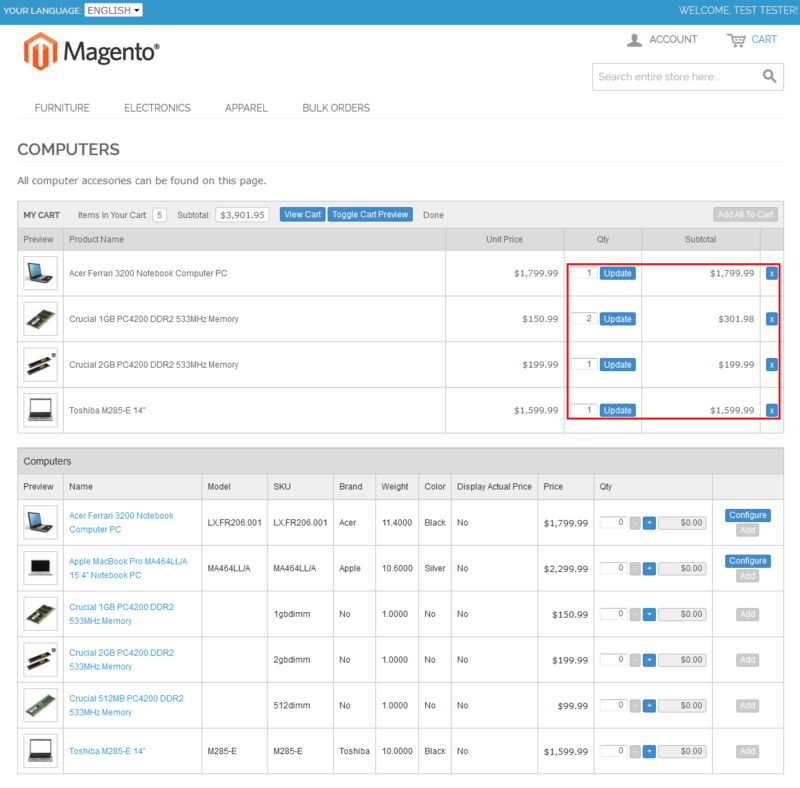 In the last step you can define products displayed on the page by selecting their product categories and SKU range. Additionally, you can hide out of stock items by unmarking 'Show Out of Stock Products' checkbox. Press 'Save' to create the page. 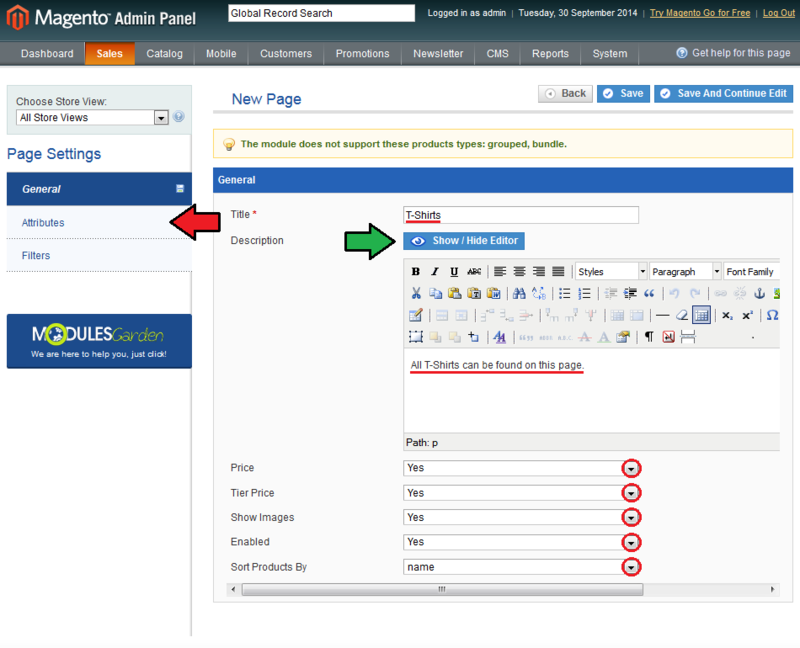 In this section we will show you the management of previously created pages. Let's start by defining the order in which pages will be displayed in the front-end. Simply fill in values into 'Sort Order' column and press 'Update Sort Orders' . If you are updating the sort order of only one page, press 'Update' next to it. Note: The first page will be the one with the lowest value in the 'Sort Order' column. Another useful feature is the ability to define a custom patch to the page. Press 'Edit' next to the page to continue. Afterwards, click on 'Create Url Rewrite' . Finish by filling in desired rewrite patch and press 'Save' . In order to preview a page, edit it and press 'Preview' . This way you can view even a disabled page. Now, proceed to the front-end. As you can see on the following screen, a new position appeared. Its name depends on the value provided in the module configuration. 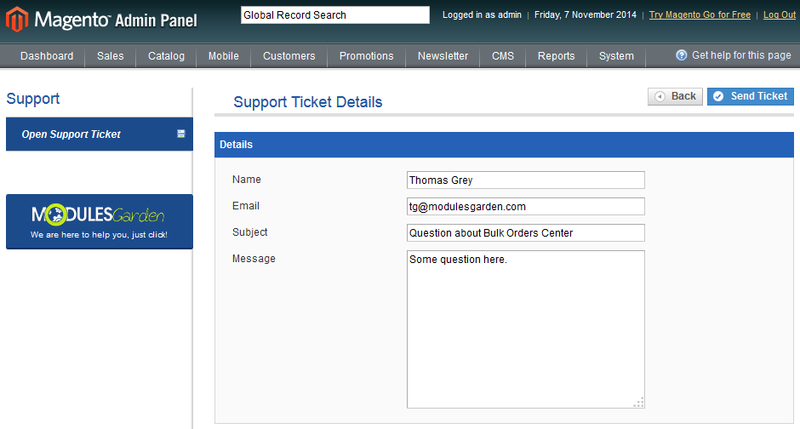 As soon as you click on it, the list of existing bulk order pages will be shown in a dropdown menu. You can define the order in which they are displayed in the back-end. 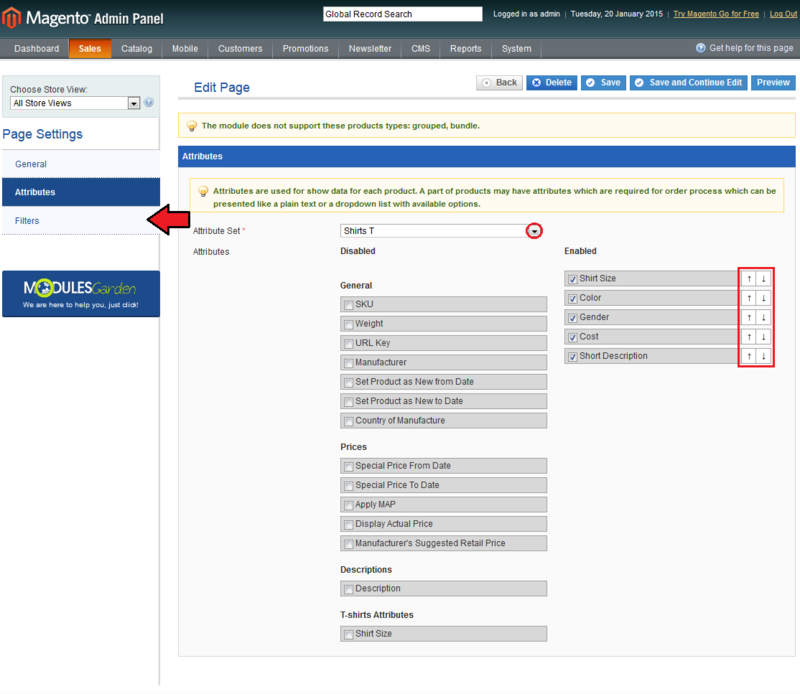 On this page your customers can view attributes enabled for a specified page as well as easily make orders for multiple products. They can increase/decrease the quantity of ordered products using +/- buttons in 'Qty' column, or simply fill in the desired amount of products. Price for the chosen amount is immediately displayed. If any of the products has configurable options, 'Configure' button will appear next to it. Pressing it results in opening a popup menu containing all options available for the product. 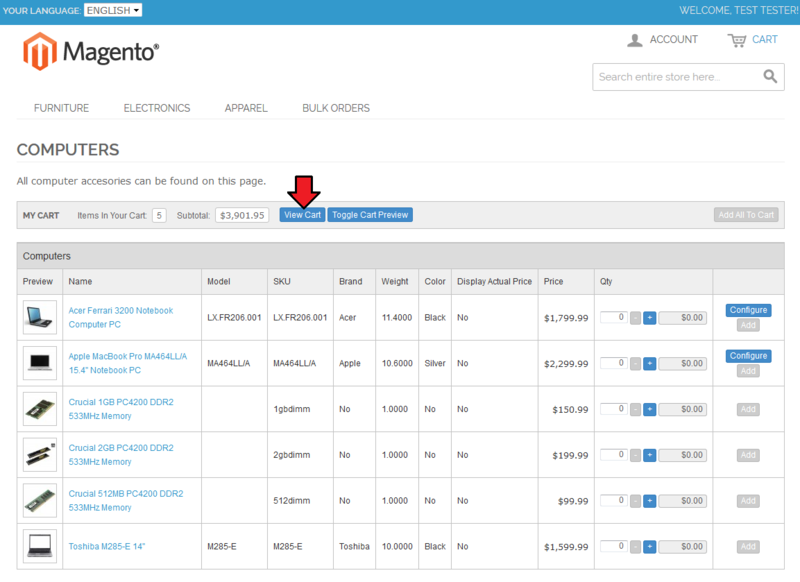 In order to add all chosen products to the cart, press 'Add All To Cart' or use 'Add' next to each of desired products. Both methods will add the specified amount of products to the cart. Additionally, upon pressing any of the buttons mentioned above, the summary of added products will be displayed as a popup menu. 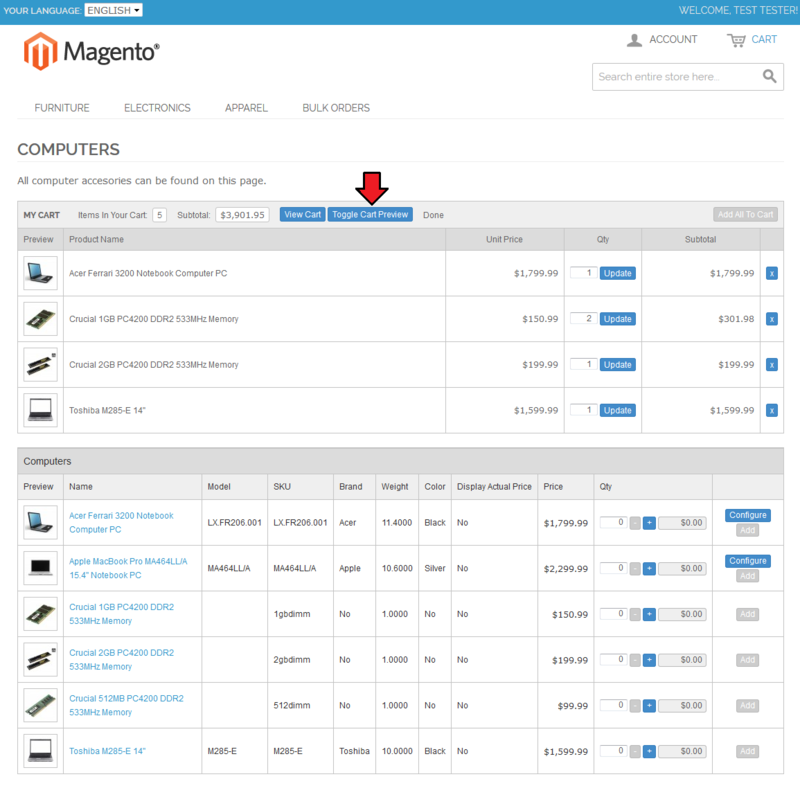 Your customers are able to view the products added to the card, without leaving the page, by pressing 'Toggle Cart Preview' . Additionally, they are able to modify products in the cart by increasing/decreasing ordered amount or removing a product completely. 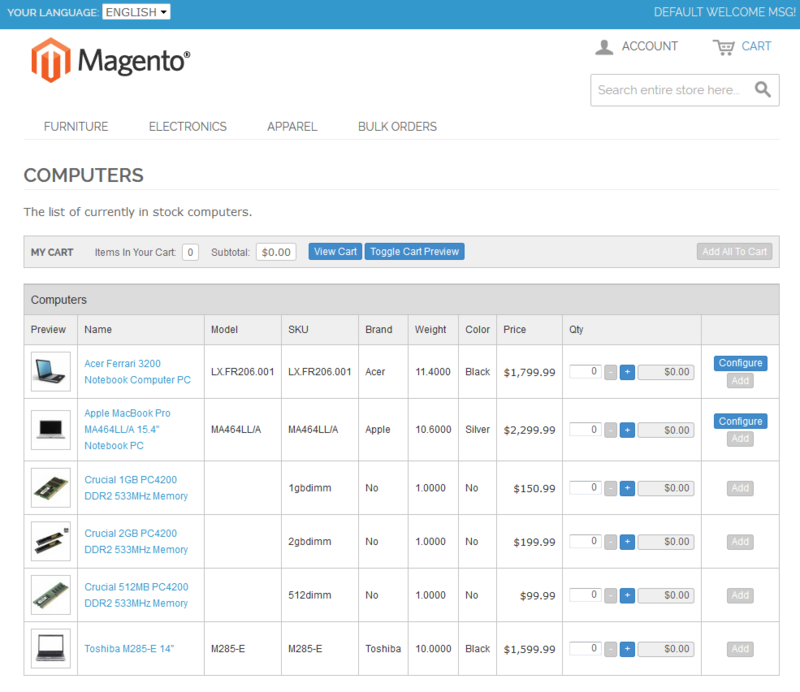 After completing the order, customers can quickly move to the cart by pressing 'View Cart' button. 1. Module supports Simple, Virtual, Downloadable and Configurable products. 2. You can easily open a ticket and ask us about your extension. Simply, go to your extension → 'Open Support Ticket' page, fill in form and press Open Support Ticket' button. 2. In case of any problems with the extension, that were not mentioned in this article, proceed to Common Problems With Magento Extensions article. This page was last modified on 14 March 2019, at 14:42. This page has been accessed 42,204 times.